Show your home state pride and that you're a deadhead if your from Illinois with our Grateful Dead Illinois Bolt Bumper Sticker. 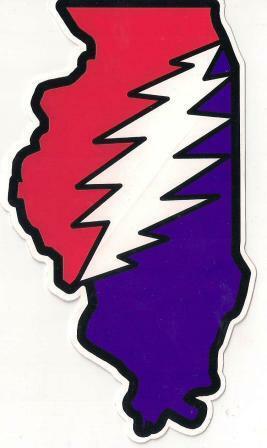 For all you Chicago area and Illinois deadheads, this is a great sticker. It measures approximately 3 1/4" x 6" and will stick anywhere. It's made of weatherproof vinyl and can go on your car, toolbox, cooler, snowboard, and wherever you want to show your Illinois Grateful Dead pride!